Rest in peace my brother. Thank you for your service and sacrifice..
may he rest in peace, may all fallen officers rest in peace as well. Hard to believe that it has been so many years already since the 3 passengers abord Heli 1 lost their lifes. May all rest in peace. I remember Trooper Toll and hus family from the Glennallen post when I was a doctor on town. He sang with his son at a talent night at church. I continue to grieve and pray for his family as we were closer to our troopers than in the lower 48. We knew them as members of our community, not just law enforcement. My oldest and dearest friend Carl Ober was the citizen killed in this crash. He will always be in my hear. My condolences to the trooper's family and the pilot's family. Five years ago today two of my friends went out to rescue a stranded citizen. I still remember my last words to Tage as he walked out the squad room door to get on the Helo with Mel. That day is as clear to me now as if it were yesterday. RIP my brothers you are missed. Rest In Peace Brother LEO. You are honored and remembered on the 5th anniversary of your EOW. From our time in High school to our brotherhood in Law Enforcement I am proud to have served along side you. RIP Tage. Trooper Toll, May God bless you and keep you safe in His arms as you live with the Lord in peace, love, and in the grace of God. You are a true testament to being an honorable and wonderful human being. Trooper tage toll, you a hero to the state of alaska. You bravely died trying to save a stranded snow-mobiler. Rest easy, fallen brother of the law. 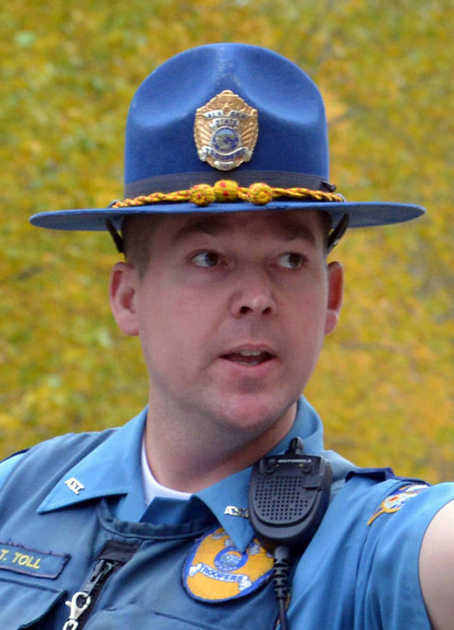 Alaska State Trooper Tage Toll was taken from us on March 30, 2013 in an accident during a search and rescue, but his dedication and humor will never be forgotten. God Bless all those who love and miss him. Trooper Toll is and always will be remembered as a Hero. I am so sorry for the loss that trooper Toll's family, friends and brother troopers are having to deal with. May god bless them all. Thank you for your service and I'm so sad for your loss and for the loss your family and friends continue to feel. May god bless you an the souls of your family. Death is final but not for the living. As a brother officer "retired" I can only pray for you an your family. I made it. But the death of a brother still impacts day to day. Again, thank you for your service and signing the ultimate check to protect others. His kids were at home, so was his loving wife, with whom he dreamed of growing old. To serve & protect, give aid and assurance, for our visitors and me and you. They went out knowing but not fearing the possibilities, that there can always be a high cost. I only met him once or twice, and a more caring man almost can't be found. He was great to work with and talk things through and a Trooper who paid more attention to details than most. he was one of those genuine souls that as a friend or neighbor you'd be more than grateful to have. one of those people who told you to go for your dreams, and do what you really want to do. he wore it with honor, pride, and confidence, ensuring due diligence and justice for all. a year and a week ago I was in Wasilla, for Tage & Mel's family, a good friend's, the Troopers', and my own sake. But what better place, than with uniformed brothers & sisters, can we stand shoulder-to-shoulder and cry? remembering not to wait for those precious moments with our loved ones, but for them truly making time. and that's what I remember from a year ago today as I say, "Thank you.... I will never forget you my friend." Just received in Hong Kong a CHRISTmas letter sent Dec 18 from Trooper Tage Toll's grandmother Margaret P. Grant and read the sad news of Tage's HOMEGOING. Tage's mother Maureen Grant Toll and I were college roommates in our freshman year. How my heart goes out to Doug & Maureen, Auntie Margaret, Tage's widow & sons, and Tage's sisters and all his family. Trusting the SAVIOR WHO was born for us, HE WHOSE Name is WONDERFUL COUNSELOR, ALMIGHTY GOD, EVERLASTING FATHER, PRINCE OF PEACE, to grant them all peace, comfort and strength especially in this season for which HE IS the REASON and in the coming days in the New Year of 2014. Though never meeting Tage, he has been a witness to GOD's love and goodness and a blessing along with his parents, grandparents, and his own family and the whole family. I learned that Tage was the grandson of my dear friend and former college roommate, Margaret Palmquist Grant. My deepest sympathy to all his family and friends. My sincerest condolences to the family of the fallen. God Bless. I too learned of Trooper Toll's death from the dedication on Alaska State Troopers. I am so very sorry for your loss. My son was killed in the line of duty on October 9, 2003. My heart still breaks every time I learn of another hero losing his/her life. I learned about Trooper Toll's death in the dedication for the new season of Alaska State Troopers on Nat Geo. My thoughts and prayers go out to his family and all the families who have lost a family member who serves to protect this great country no matter what branch they served in whether military, law enforcement or forestry service. I have dealt personally with the worry and waiting that all of these families go through while my son served in the Army and did 2 tours-Iraq and Afghanistan. The good Lord saw fit to bring him home safely. Thank you all family and members for the sacrifices that you all have made.